> Rifle Scopes> What's the difference between 30mm and 1 inch scopes? Rifle scopes are usually manufactured and sold either as 1 inch scopes or 30 mm scopes. There is also a much smaller selection of 34mm scopes, but those are usually reserved for the high-end tactical shooter. One inch scopes are by far the most numerous and popular rifle scopes currently available due to a lower production cost and accessory availability, but 30mm scopes are becoming more and more popular as hunters and tactical shooters move towards larger and more high-end scopes. What is the difference between 30mm and 1 inch scope tubes? A 1 inch rifle scope has a main tube diameter of 1 inch, or 25.4mm. A 30mm scope's main tube is 30mm thick, obviously. This was originally due to differences in manufacturing methods and the fact that European manufacturers used the metric system. However, a 30mm scope does offer two advantages over one inch scopes. The first is that 30mm scopes are sometimes considered more durable and higher quality, but this is because of a long history of misinformation on the subject. The second is that 30mm scopes will usually have a larger internal adjustment range, making them better suited for long range target shooting and long range hunting. Is a 30mm scope better than a 1 inch scope, or vice-versa? Neither design is inherently "better." Some hunters and shooters prefer 30mm scopes, others prefer 1 inch scopes. It's really just a matter of preference. If you're the type of person who hunts and shoots in harsh conditions, you may want to look at a 30mm scope. Most shooters will do just fine with a 1 inch scope. In addition, there are many more one inch scope offerings available, and most rifle scope manufacturers are more likely to have their scopes offered in a one inch size. Are 30mm and 1 inch rifle scopes interchangeable? No, they are not. But it is possible to mount a 1 inch scope in 30mm rings using spacers that decrease the inside inner diameter of the rings. It is not possible to mount a 30mm scope in a set of 1 inch rings. You should always buy the correct scope rings to mount your scope. If you have a one inch scope body, you should buy one inch scope rings. 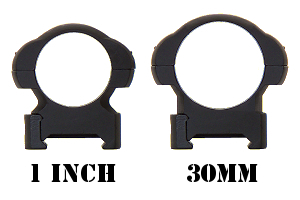 If you have a 30mm scope body, you should buy 30mm scope rings. Do 30mm scopes provide better light transmission? It is possible for a 30mm scope to have slightly better light transmission and low-light performance than an equivalent 1 inch scope due to the difference in possible lens sizes. But the differences in light transmission are minimal. A better indication of light transmission and low-light performance is quality of optical components and objective lens size. Why bother with a 30mm tube if 1 inch is just as good? Scopes with 30mm tubes will sometimes (but not always) have more internal adjustment, making them a better tool for shooting long distances. Scopes with 1 inch tubes may run out of internal adjustment, maxing out their range before the firearm it's mounted to, leaving the shooter with a maximum range far under their rifle's capability. This is not a rule, and some scopes with one inch tubes may still have more internal adjustment range than others. If you have a rifle scope that runs out of internal adjustment before you can dial in for a long distance, you can compensate for this by utilizing a scope base that adds 20 MOA or more to your adjustment range. What size scope should I buy? Scope tube diameter should only be a consideration if you're routinely shooting at distances beyond 500 yards, which is where 1 inch scopes will start running out of internal adjustment. If you're not shooting long distances, a 1 inch scope will do just fine. Also, it's worth noting that scopes with 30mm tubes are often slightly more expensive than those with 1" tubes. This is not because they are better quality, but rather because of the misconceptions that 30mm scopes are just "better," and because of slightly higher production costs. So if you want a good scope but are limited by price, don't worry about the size of the main body tube. Get the scope you want, and a set of rings that will fit.